Travel with Kevin and Ruth! 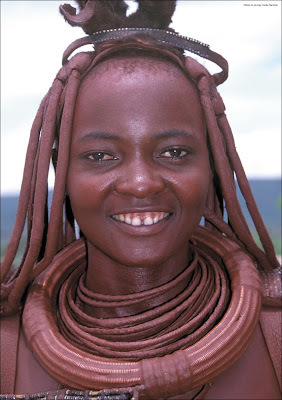 : Would you visit the Himba people? The country of Namibia has 11 major distinct ethnic groups of people. One of them is the Himba, a nomadic tribe of people who appear to have been forgotten by the rest of the world. Even though they say there are between 20,000 and 50,000 of these people living in the extreme isolation of the northwest corner of Namibia, they don't receive many visitors, and because of their nomadic existence they are somewhat difficult to find in the first place. The Himba are some of the people you would typically see in a National Geographic magazine. Photo Courtesy of Namibia Tourism. So, to visit a village like this, it would be a little difficult. It's not like you can just hop in your 4x4 and while driving through just stop in at the local store and buy a cold drink and wander around. And of course, it's the people that you want to see and you don't want to be intrusive and walk around snapping photos of them. We like meeting people of different cultures and spending time with them to see how they live. This would be a different culture, that's for sure! But another challenge related to that is the language difference. I bet it would be tough to find one of them who can speak English, and with that communication problem it would be almost impossible to make a visit worthwhile. However, it is possible to visit. But, you have to find and hire a guide who speaks English and Otjihimba, or go with a specialized tour operator. Even then, there are warnings about treating your visit as a cultural exchange and that "this should be undertaken with sensitivity and respect for their traditions and lifestyle". Then, the question is...do the Himba want you to visit in the first place? From reading accounts of people who have been there they are not 100% sure, however they do say they were treated with courtesy and it seemed the Himba were as curious about the visitors as the other way around. My fear is that it would be a little like a circus side show, or that the Himba act differently for their visitors than they would if we weren't there. Although this area gets so few visitors in the first place that to have any type of a touristy feel would seem to be of no value to them. The other thing that kind of bothers me is the following statement...Request permission before taking photographs, and if photographing the Himba, it is appropriate to pay a small fee in exchange for the photo. I would have no problem bringing something that they need and use....like some kind of food or something. But if paying a fee, does that mean that they are more commercialized than they want us to think they are? What do you think? Would you visit the Himba? Not being able to communicate would make it a no for me. But if you decide on a yes - it ought to make a very interest blog post. Not being able to speak the language hasn't stopped us before but then we have always had an English/Spanish or English/Czech dictionary with us. I don't think there is an Englsh/Himba dictionary out there, guess that is why you would take a guide with you. Nope, honestly I would leave them alone. Just my thoughts anyway. Thanks for your thoughts Karen. I think we will make the decision once we get there and have talked to more people about it and gotten their thoughts on the subject. 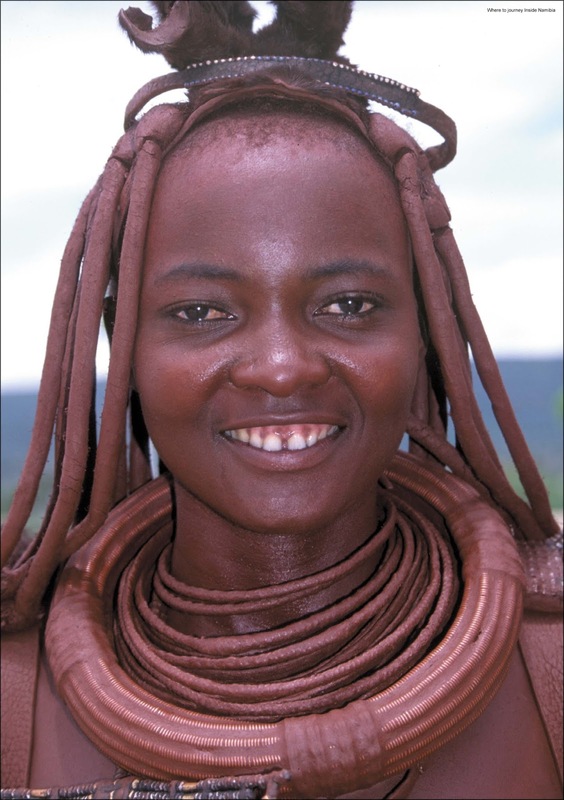 The photo for a fee may nit be coming from the Himba's but from those organizing the tour. I personally would leave them alone and not subject them to outside influences. I think that if we were to visit them we would take food staples that they are finding hard to get. We have not made a decision at this time, we will think more about it and try to acquire more information first. Yes, that is one way to look at it. I would not. I don't even like traveling through Amish country and seeing the people there. I feel it's like visiting a (human)zoo. True, but often some communities want you to understand their differences/cultures so long as you are respectful and as Kevin says don't make a circus out of it. That is one of the reasons we are gathering everyone's opinions on it, so we can look at both sides and decide if our visit would be good or harmful. From the information that we have read so far that is not the case with the Himba, this would be one of their own villages but we aren't certain on this. The Namibia Tourism even has a visit to them on their tourism website but it is something not a lot of people do because it isn't easy to get to or it is something that is out of their comfort zone. We will think more on this and also talk to more people once we are in Namibia before making a decision. I think it would be a fabulous opportunity for you two but not sure for them. I think we need to be sensitive to other's needs. I am a bit nervous about even going to Monument Valley. I will not be sneaking any photos of the Native Americans. I am glad that we are getting lots of comments on this subject, it is certainly making us think more about the pros and cons. We certainly don't want to be intrusive yet it would certainly be interesting to see them and understand their culture more. We didn't when we were in Namibia but one of the group of people I was travelling with saw 2 Himba at the roadside as sped past. I am aware of them because I did quite a bit of reading about them before I left England. There is a book by a British Explorer, Benedict Allen called The Skeleton Coast where he spends time with the Himba before travelling along the S.Coast on a camel. He's amazing, we've seen him talk, and this expedition remains one of favourites and why I think I wanted to go to Namibia in the first place! Thank you for these links, maybe they will give us more insight into our decision making. When I was in Sydney I had the "rare opportunity" to visit with "real aborgines!" They were panhandling outside the science museum---not quite the kind of interaction I was hoping for. So if you do run into a himba just doing their normal thing, consider a unique technological gift, like one of those solar dancing plants. You may get something in return a lot more special than a photo. Definitely not wanting to see them panhandling, not quite the interaction we are looking for. I would love to just happen to meet up with them by accident though, I think that would be a much more normal way and much more special to us, just the way we have met with so many of our Mexican friends. Boy that's a hard one. I'm inclined to say leave them alone so as not to intrude into their world and bring anything from the outside. If they were to welcome visitors then I might feel differently. The pay for pictures thing is something the SW Native Americans do apparently and one of the reasons I don't take my camera there. It really is a very hard line to determine what respects another's culture while showing admiration which I definitely have for these people. All that said - I LOVE your header picture. Thanks for your thoughts Sherry and that is much the way we are feeling. It is a tough decision and that is why I think we need to get to Namibia first and then start talking to more of the local people and get their thoughts on this matter. Should we find out that they would rather just be left alone then we will not intrude on their lives. I think it would be an intrusion. Imagine someone walking into my yard and saying, "Hi, I'm from Namibia and I wanted to see how you live. What's that you're cooking there?" Like people visiting Mexico and they don't ask permission to take pictures of people doing everyday things. I think with a guide it would be acceptable. The guide has contacts and the people understand why you're there and what your intentions are. I wouldn't miss the opportunity. I'm a very curious person and would hate to see this pass me by. After all, when will you be back in Africa? I think if they invite guided tours in exchange for money then it's hardly an intrusion. Should we visit them, we would definitely do it with a guide. As I had mentioned above Chris, the Namibia Tourism actually has a visit to them as a suggestion of something to do, they refer to this as adventure tourism because it gives you insight into one of the many different cultures that are in Namibia and one of the oldest cultures. We just don't want to do it and bring more attention to them if that isn't what they want, we need to be sensitive to their privacy if that is what they desire. No I don't think so, would be an intrusion. It's only an intrusion if they don't want the visitors and if we find that out, then we won't go. I say "Wait and see." If an opportunity arises and seems unobtrusive, I'd go for it. I respect people's wishes re: photography. But, I do not pay cash to take a photo. I have often carried something useful for people in an area of the World and offer it. Otherwise I take lots of photos without having faces too identifiable. Cute story: Years ago, I was visiting China with a group led by a Chinese-American woman. She suggested that if we wanted to give a gift, many of the women liked lipsticks as they were considered such a luxury at that time. I bought several and when I asked a young woman if I could take a photo of her twins (a rarity in the one child per family culture), she indicated that yes, it would be fine. After I took the photo I gave her one of the lipsticks, which she immediately used to place red lipstick dots on each of the twins' cheeks. I took an 'after' photo of that! Also, in some countries it's really bad form to photograph women so I've taken lots of beautiful pictures of profiles or back s of women and have not 'insulted' them with a record of their face. We agree with you Mary-Pat and that is what we will do. We will do more research into this and once we are in Namibia we will start asking around and find out what other people's opinions are on this matter before making our decision. Love your story, it is a cute one. Hi, just found your blog, as we are "slow" travelers and interested in following your RV lifestyle when we get home (if we ever go home...). Coincidentally, we are in southern Africa and will be in northern Namibia in November/December. Perhaps you will be interested to order a copy of the local "outdoorsy" travel magazine, "Go!" Their Go! Namibia issue (https://www.gomag.co.za/product/namibia-2013/) has been a huge help in planning. Whether you tour a village or not, if you spend some time in that area you'll just run into local people in the grocery store or selling firewood along the road. Sometimes those are the most fun conversations (or pantomimes)! From one of the articles in the magazine issue I mentioned: "It's the kind of general store that sells everything from a 100L cooking pot to a packet of chocolate eclairs. ...I queue with a Herero woman outfitted head to toe in traditional dress and a Himba woman wearing only a leather skirt and bracelets." Feel free to look us up when you're in the area! 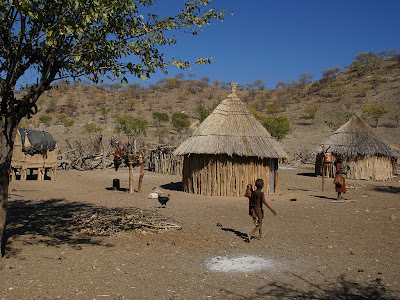 We will be off the beaten path much of the time and hope to stop in at the little towns and villages along the way so as you said we should have a number of opportunities to meet up with the local people and if we are lucky enough we may even bump into a Himba or two. Oops, sorry for another post, but I remembered an article I read (in Go! of course) several months ago and finally tracked it down. Namibia has an excellent organization supporting 40+ community-based camps which allow access to local communities and also find a much-needed campsite in some incredibly remote country. Some of the communities have museums and offer tours, and others just have elephants wandering through your campsite... take your pick! We'll be using them, as they are quite off the beaten path and during December, Namibia is overrun with South Africans on summer holiday (mainstream campsites fill fast). Plus I feel like it's one very good option when considering the dilemma you posted in this entry! Love the idea of these community based camps but not sure exactly how we will be traveling (mode of travel) after our first 3 1/2 weeks are up where we will be supplied with a 4 x 4 truck with a roof-top tent and also our campgrounds fees at lodges and campgrounds along the way. We still working out the logistics for after that, not sure if it will be by bus or possibly a rental car and we also have 25 nights to use up at the Gondwana lodges. We will certainly keep these campsites in mind though, they sound interesting and could be a lot of fun. Thank you once again, looking forward to meeting up with you in Namibia, hopefully in November.